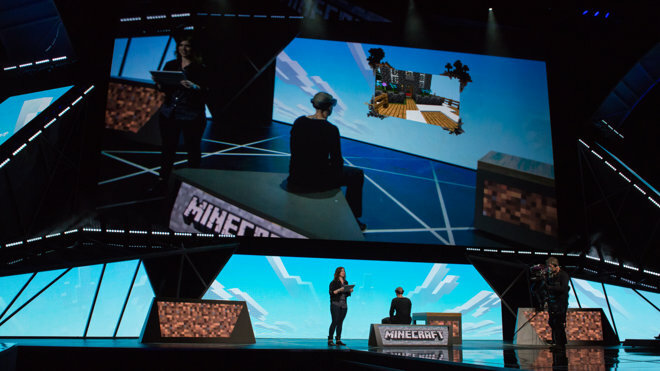 Minecraft developer Mojang AB did a presentation during Microsoft's Electronic Entertainment Expo keynote, in which the HoloLens was used to interact with a Minecraft world as projected onto a table. Microsoft's augmented reality glasses create the illusion that virtual worlds are actually mixed with the real world in front of the user. In this demonstration, the map of a Minecraft world was placed on a table, and the user wearing HoloLens could interact with the map, items, and characters displayed in front of them. The HoloLens demo was done in tandem with a second player who was controlling their own Minecraft character via a Microsoft Surface. Further details on HoloLens, such as release date or pricing, were not revealed. 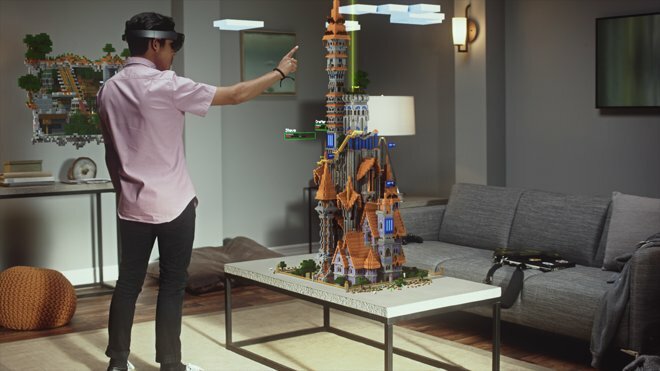 The company simply said that HoloLens will support a fully-featured version of Minecraft that will allow players to explore the game world in full 3D. Microsoft unveiled HoloLens back in January, generating a large amount of buzz for its hardware concept. The Redmond, Wash., software giant is betting big on the future of virtual reality, as it has also partnered with Oculus Rift and game maker Valve's VR collaboration with HTC. HoloLens looks much like a plastic headband with a glass shield over the wearer's eyes. 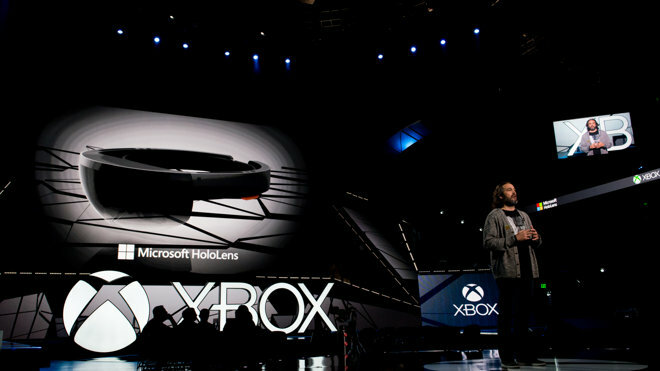 The device contains a full computer, including what Microsoft says is a "high-end" CPU and GPU, along with an in-house "holographic processing unit." The shield itself is see-through, and it projects holograms directly over what the user sees, giving the illusion of virtual and physical worlds merging together. Microsoft didn't say on Monday whether HoloLens will work with the Xbox One game console or if it will just operate with Windows 10 devices. The company's collaboration with Valve VR is for Windows 10 only, and does not apply to Xbox One. Meanwhile, the Oculus Rift partnership will allow users to stream Xbox One games to their Windows 10 PC, where the games can be played in a 3D-like "theater mode" that does not change the gameplay of the titles themselves. Apple has shown interest in virtual reality through patent filings and a number of hiring sprees, but the company does not announce future technology well in advance, unlike Microsoft and its strategy with HoloLens. If Apple is indeed working on a consumer virtual reality product, its existence likely would not be revealed until the product is nearly finalized, as it did in unveiling the Apple Watch in late 2014 before an early 2015 launch. As for Microsoft's Xbox One console, the company is banking on sequels and re-releases of established franchises and titles, such as "Halo 5: Guardians," "Forza Motorsport 6," "Gears of War: Ultimate Edition," "Fable Legends," and "Rare Replay," all of which will be available this fall. It's believed that Apple could become a competitor in the set-top box gaming market with an anticipated update for its Apple TV hardware said to be in the works. It is rumored that the new hardware will include an App Store where titles such as games could be downloaded and played on an HDTV, pitting the Apple TV against the likes of the Xbox One, Sony's PlayStation 4, and Nintendo's Wii U.